The dangers of lead in jewelry is a hot topic these days with all the news reports of jewelry items being pulled from store shelves. What comes to mind for most when considering the dangers of lead is old household paints which contain lead. While chipping paint in old houses is a big concern with small children, there are many more dangers to consider. Ingestion of lead can lead to poisoning which affects the brain, learning abilities and can cause behavioral problems. Lead can cause organ damage and poisoning that can result in death. There is no one more susceptible than a small growing and developing child. It is my sincere wish is to educate and protect us all from the dangers of lead in jewelry. There is a big need for education on lead in jewelry. It is surprising how unaware many people are about the lead content in millions of items being sold every year and, the cheaper the item, the more likely it is to have a high lead content. The problem with cheap jewelry is twofold; first, the operative word here is "cheap" which means the items appeal to those with a small budget...mainly children. So, even if they are not marketed to children they entice children because of their affordability. Second, the operative word is, again, "cheap." These items often fall apart potentially leaving small parts laying around in junk drawers or on the floor to tempt a toddler. Take for example the preteen who purchases a trinket at the dollar store or big box store. Perhaps she's not in danger of putting the item in her mouth. Although, older children will often play with a charm in their mouth when it is on the end of chain. Consider then, when this item is carelessly tossed aside once the trinket is replaced by her latest purchase. Now, her little sister, who is three, could have access to the item. Now the dangers of lead in this seemingly harmless fashion item is in her hands ...or worse, in her mouth. In 2006, four year old Jarnell Brown in Minnesota swallowed a little heart charm that had belonged to a bracelet. This bracelet was a giveaway item that came with a pair of running shoes from Reebok. The reason the dangers of lead is so very threatening is because children of all ages put things in their mouth. We are all concerned with choking, but what many people do not realize is that often children cannot control swallowing. it just happens. Looking at the charm that this poor little boy swallowed one would never guess that it had any lead let alone a lethal lead content. Even with my twenty plus years in the jewelry business and my knowledge of potential lead bearing products, there where no alarm bells that went off in my mind when I saw the photo of the charm that this child swallowed. First of all the heart charm was relatively flat which looks like it could be a plated brass stamping. The charm also does not look easy to swallow, but I learned the lesson years ago that often a child will accidentally swallow an item even if it is not smooth or round. It is horrifying that this innocent looking bracelet was the cause of Jarnell Brown's death because it contained ninety-nine percent lead. This page is really hard for me to write because I have two small children and my four year old is just the type to get into stuff if you are not keeping a close eye all the time. My heart goes out to this poor little boy's mother and father and I so wish that they did not have to suffer such a painful experience losing their child and knowing that he suffered greatly along the way. Oh boy... the tears come every time I think about this story. This story is what I always remember when I think how passionate I feel about educating the public about lead. As for Jarnell and the people he leaves behind, there will always be a hole, a very painful void regarding his loss. We all wish if only this...or if that... but unfortunately, there are losses that are far too big in life that we cannot fix. Here is a report that aired on CBC Marketplace on January 15 2016, on toxic Jewelry. Read the full article here. If this doesn't get you thinking about the concerns of lead and Cadmium both in finished jewelry and the supplies you are using in your business, I don't know what will. Check out what they have to say about what the manufacturers are doing in China. If your child has swallowed an item it is important to get medical attention right away and express your concerns clearly about lead or cadmium content. •If buying directly from a jewelry artist try to find out what kind of components they use and if they actually have good knowledge of what the lead content is in their components. You cannot simply feel assured because the artisan assumes their components do not contain lead. •Do not assume that lead free labeling guarantees the item is lead free. •If you own any questionable jewelry or small charms keep them in inaccessible places like a locked box or in a high cupboard away from small children. •Educate your older children regarding the dangers of lead in cheap jewelry and monitor what comes in and out of the house. Often older children would not think twice about leaving costume jewelry laying around. Make sure they are not within reach of younger children. •Just as you would teach your child not to take candy from a stranger, teach them not to accept little trinkets or charms from friends. Talk to them often and in ways that they can understand. Explain the dangers of lead and show them pictures online of jewelry items that contain lead, especially ones that surprise you in terms of their lead content. •Be choosy about your purchases for birthday parties for your children's friends. Stay away from cheap jewelry and jewelry making kits unless you can, without a doubt, verify the lead content. •Jewelry made from multiple layers of metal such as brass or copper may contain lead in the solder that holds the layers together. 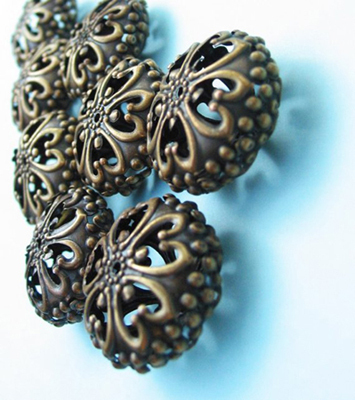 This is typical of collectable antique jewelry made from brass stampings. If you can determine that an item has been soldered, it is best to keep the item away from small children especially if the parts are small or are likely to break off. •If you are a jeweler concerned with the dangers of lead and possess materials that may need testing keep your supply room and materials locked and inaccessible to small children. Consider which items are questionable and have them professionally tested. •Research suppliers and get information on lead content prior to purchasing. Do not assume that "lead free" and "lead safe" claims guarantee their products when it comes to the dangers of lead. After August 2009 the California government changed the lead limit in jewelry from 600ppm (parts per million) and dropped the limit to 300ppm. The Federal law for lead content in children's jewelry is 100 parts per million. Unfortunately it often takes devastating events for the government to step in and tighten the laws. It is my goal to start a movement in the jewelry industry and amongst every day consumers to take personal responsibility regarding the dangers of lead in jewelry. The more educated and demanding the public is, the more pressure will be on the manufacturers to adhere to strict standards regarding toxic substances in jewelry and jewelry findings. And this education, unfortunately, does not stop at lead. As soon as the pressure was on about lead content, manufacturers quickly found that Cadmium, which is equally toxic but economical, made a great substitute for lead. The latest jewelry recalls have turned up not only lead and cadmium but, arsenic. I shudder to think what harm will come from merely sucking on a pendant charm containing arsenic would do. I am sure if you had access to all the homes in North America it would be a shock to find that a good percentage of those homes have more than one item which contains a toxic amount of lead. Most people have no idea what they are buying and potentially just how much lead content there is in what they bring home for a song. It is not just the dangers of lead, but the dangers in believing the lies around lead content. A consumer is more apt to buy jewelry that is labeled "lead free." Just seeing those words printed right onto the packaging instills a false sense of confidence in the manufacturer and the retailer, and yet, thousands of items labelled "lead free" are pulled every year for toxic lead levels. Consumers put a fair bit of confidence in retailers when it comes to the dangers of lead in jewelry. Many feel that they are safe in purchasing jewelry from large stores such as Walmart and Target, yet recent articles include these stores as sources for some high lead-containing items that are pulled from store shelves. To see photos of high lead containing jewelry please visit this California lead in jewelry page. The purpose of this article is not to point fingers, but to educate. The problem we face with the dangers of lead in jewelry is widespread. It is not just the dollar stores and the accessory store chains, but it is in our large department stores...and yes our home-grown, handmade items by artists in our own country. As a jeweler you may think, well... my items are lead free because I make my own jewelry, but are they? Unless you are an artist making your jewelry entirely out of polymer clay, shrink plastic, sterling silver or pure gold, you are more than likely dependent on supplies that originate in other countries that do not enforce standards around lead content. 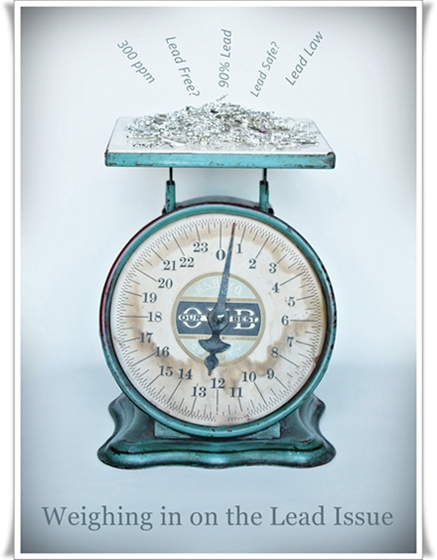 It's important as a jeweler that you familiarize yourself with the laws, both state and federal, regarding lead content. The limits will vary for items that are plated and those that are unfinished. For more information please visit California's Lead in Jewelry page and the Consumer Product Safety Commission as well as the government sites for the state or Province in which you reside. So how do you then know what is in the materials you are using? That is a good question. Without testing your components or buying from reputable suppliers who provide product information, it is very difficult to determine high lead content and what is safe. Any supplier that is selling lead free findings for jewelry making should be able to provide information on the materials and verify that they are lead free. Some suppliers may list their findings as lead safe. When it comes to the dangers of lead content in findings how does a supplier assess that an item is "lead safe?" These are all questions that you must ask your suppliers and if you are not satisfied with the answers, it is always a good idea to have items tested that you use on a regular basis. In my opinion, we should all familiarize ourselves with the potential dangers of lead. Not only are we legally liable, we also need to be accountable. While it is important to protect your business, I strongly believe, in the bigger picture, it is about protecting children. Most of us either have children of our own, plan to have children or have children in our lives. Even if I was not a mother I would feel a sense of responsibility for all children of this world and care about keeping them safe from the dangers of lead. •Cast items - these include cast charms, lobster clasps, beads, bead caps, bails etc... made from white metal, pewter, zinc alloy including Tibetan-style beads/components and cast brass items. Although these items can be made lead free, I consider them high on the dangers of lead list because of their sheer volume of metal. If the manufacturer so chooses, this volume can be filled with over ninety percent lead content and, therefor, potentially carry the most lead of any jewelry product. •Enamelled items - Charms and components. 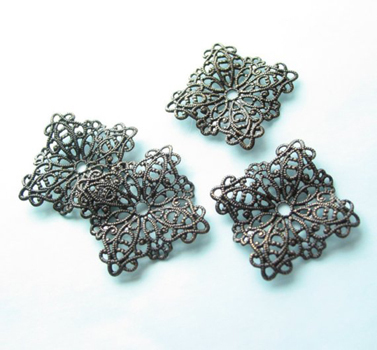 Many enamels contain lead and this makes enamelled charms also high on the lead content list as lead could potentially lay not only in the surface enamel, but in the charm itself. •Ceramic items - pigments in ceramic glazes can contain lead. •Crystal glass beads and pendants - Asian, Czech and Austrian crystals contain added lead in order to obtain their refractive finish. These items are on the DO NOT USE list for children's jewelry. Of the three main countries that manufacture crystal, Austrian Swarovski crystal claims the highest lead content. •Solder - Solder may contain lead. Although solder is readily available in a lead free form, I know several jewelry artists who still work with leaded solder because of the ease of use. Some supplies such as ring shanks with a glue pad area are fastened together with solder. Depending on the country of origin and the manufacturer that solder may contain lead. •Wooden items - beads and pendants made from wood can contain lead in the coatings and paint finishes. •Plastic (including plastic parts in children's jewelry) - Sometimes lead is used to soften plastic, stabilize plastics or in special coatings on plastics. •USA made brass stampings - Most US manufacturers adhere to the strict regulations regarding lead content and should be able to verify safety regarding lead content. Please check with your supplier for product information. •Natural materials - freshwater pearl, most gemstones, cultured pearls, unfinished wood, natural fibres, leather, shell, karat gold and sterling silver, providing lead has not been added. •Glass - plain glass beads generally do not contain lead, but glass beads or components with special finishes may contain lead. The above list of safe and unsafe items is based on my experience in using and learning about such materials. It is up to each individual to initiate proper testing in order to verify material safety. I cannot take responsibility for the dangers of lead in materials that have not been professionally tested. The issue regarding the dangers of lead is a big and complex topic. The responsibility regarding lead content safety lies solely in the hands of each individual manufacturer. The more each one of us takes responsibility, the more we can affect change and keep the truly innocent safe from the dangers of lead.